We’ve done a good amount of reporting on the virtual currency Bitcoin over the past few years here at Techfaster.com We’ve seen the virtual currency take a stride at becoming more mainstream with Overstock.com, Dish Networks and Expedia adopting bitcoin as a method of payment. Even our friends at Mobile Nations allow you to buy from their huge inventory of wireless accessories with Bitcoin. Bitcoin is taking an even biggest step into the mainstream with a just announced NCAA football bowl sponsorship. The Bitcoin St. Petersburg Bowl will take place December 26th at Tropicana Field, home of Major League Baseball’s Tampa Bay Rays. The bowl game was previously sponsored by Beef O’Brady’s and Magic Jack. Bitpay struck the deal with ESPN and it appears it was a big enough deal for a single flagship sponsor. Bitcoin will now be featured all over the stadium from on-field signage to stadium signage, interactive graphics and TV video graphics. 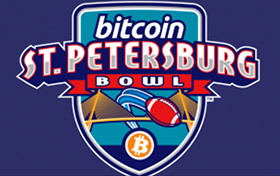 Announcers, commentators and even commercials promoting the event will refer to it as the Bitcoin St. Petersburg Bowl. It’s actually a pretty smart idea to start educating people about Bitcoin. “Our goal is to continue to move bitcoin into the mainstream and sponsoring the St. Petersburg Bowl offers us that opportunity. College football fans and the bitcoin community represent a similar target demographic – tech-savvy men between the ages of 18 and 40 [years old].” Bitpay Executive Chairman Tony Gallippi said in a statement. ESPN and Bitpay have also struck up a deal to accept Bitcoin for ticket purchases and merchandise purchases for the Bitcoin St. Petersburg Bowl. Elsewhere in professional sports the Sacremento Kings NBA team and the San Jose Earthquakes soccer club both accept Bitcoin for merchandise and ticket purchasing.